The Nikken Business Opportunity in Perspective - Real Earnings Figures Revealed! Nikken enjoys a reputation as a product driven company. Its successful 40 - year track record and international expansion has helped make it one of the fastest growing and most successful network marketing companies in the world. This dynamic growth comes for a number of reasons, not the least of which is the terrific income opportunity that Nikken provides. However earnings figures in Network Marketing can sometimes feel rather nebulous and theoretical. Presentations often show the leveraging effects of building a team of 3 x 9 x 27 x 81 etc - fine in theory but rarely how it happens in the real world. So what are the real figures? What Can I Earn In Nikken? How much does the average Nikken Consultant make in terms of monthly income — or annual income? Does pursuing a Nikken home based business benefit me financially? What are the best steps to take along the way? What kind of return can I expect in relation to the effort I am putting in? The chart below averages both general income and specific levels of achievement from the Senior Consultant rank up to Royal Diamond. Nikken Consultants of every level have shared the Nikken home based business opportunity with others and have used it as a pillar to build a solid, secure financial future. The chart gives average figures for all active Consultants and for all individuals at certain levels in Nikken in the US. The stats show a wide range. As long as 240 months after signing up (20 years), some Nikken Consultants are still at Direct or Senior Consultant level, while others have climbed to the rank of Diamond or Royal Diamond. Many of course advance much quicker. A Direct consultant earned on average $116 in the year, with the top earner at $1,109 (ie. about $100 a month). The top Silver consultant earned $17,354 with the average being $552 — Silver is the first "serious" rank where you will have a team and can begin to earn leadership bonuses. It is also very achievable and accounts for about a third of all Nikken consultants. At the next levels of Gold and Platinum earnings roughly double respectively — the average levels begin to provide a significant bonus but not yet a living wage alone, although the top earners are achieving this with over $40,000 a year. The real difference is seen at the Diamond ranks where six figure earnings are achievable. One person achieved the top rank of Royal Diamond within 10 months! Average earnings at this rank are over $100,000 pa with the top earner achieving a fraction under $750k. Overall the figures tend to comply with industry findings that on average around 5% are "successful" in network marketing - of course this depends on your own goals and definitions of success. For a start financial wellbeing is only one measure of the success of a venture. Nikken prides itself on striving for balance in 5 areas of life - mind, body, society, family, and finances, and many consultants gain hugely from personal development. The higher levels of income and achievement rely heavily on personal effort and individual application. The majority of superior performances rely upon the individual’s skill, training, effective business-building techniques and good old-fashioned hard work. Many network marketers feel they spend a period not earning what they deserve, followed by a period earning more than they feel they deserve. This is a result of moving from time restricted earnings to the exponential mathematics of leveraging a team. And there is no question attitude plays a major role. Some people are passionate about their Nikken business and approach it with a sense of urgency. Others, though they may be committed, are not in such a hurry. That's fine. Stickability is also a huge asset. Many people start such a venture and then give up after a couple of months. One of the joys of a home based business is you can fit it around your needs. At the recent "Team Kaizen" meeting in Mexico one of my big "takeaways" was not only the numerous different methods people used to be successful in Nikken, but also the various different types of people on the team. There are many different ways to do Nikken. It is also significant, however, to note that tens of thousands of households in North America use Nikken products as end users with no thought of building a Nikken business. This is not surprising. Nikken products have been sold by the millions worldwide, and the company remains a world leader in broad spectrum wellness technology. 1. Nikken is not a "get-rich-quick" scheme. Your success is more likely to be`proportionate to the amount of work and effort you’re willing to put into your Nikken home based business — to sell your products to retail customers, to share the principles of the Nikken 5 Pillars of Health® and to help motivate, educate and inspire others. 2. All commissions and bonuses are based only on sales of products to retail customers. Front-end loading of inventory is prohibited. Retail orders should be shipped directly to customers. Potential commissions rise with the size of a consultant's team but building a team alone is not sufficient to build an income — ultimately the members of the team must be actively making regular retail sales. 3. Every Nikken home based business is built on an individual’s own efforts. No legitimate Nikken business can be built on promises made to help someone else "build their business". The most successful Consultant businesses are built by Nikken Consultants encouraging, training and supporting others. This includes the proper sharing of Nikken product knowledge, product technology, and the lifestyle benefits programs. It is through the diligent and enthusiastic application of the Nikken 5 Pillars of Health® that successful Nikken home based businesses are built. With integrity and by empowering others to be the best they can be, we can all grow and prosper together. The income figures are based on bonus earnings and are indicative only of incomes that can be made. The incomes stated included all overrides and leadership, retail, pack bonus and lifestyle bonuses actually earned during the time period of January 2016 to December 2016. To be conservative, for the purpose of these statistics, the highest active status achieved during this 12-month period determined the sponsoring levels and leadership development levels. 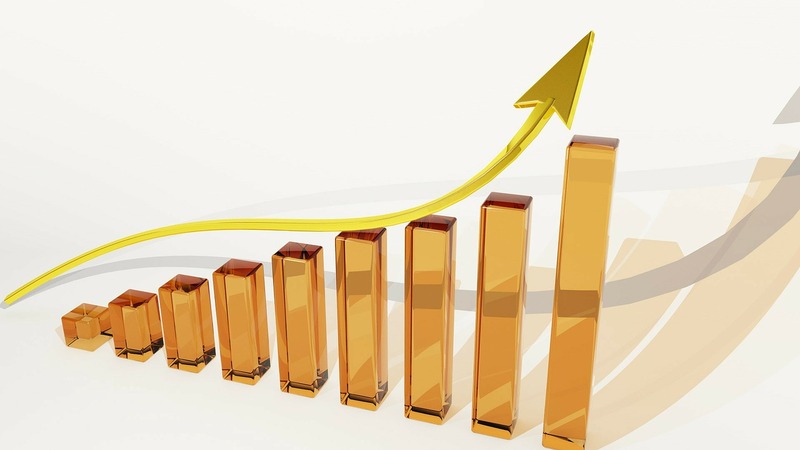 If a Consultant achieved the Bronze status for one month during this 12-month period, his/her income statistics are included in the Bronze level status. The information here is not necessarily representative of what any individual Consultant will earn with these Annual Income Statistics. Any representation or guarantee of specific earnings would be misleading. Please Note: The Nikken Compensation Plan changed significantly on 1st January 2017. The table above is for 2016. 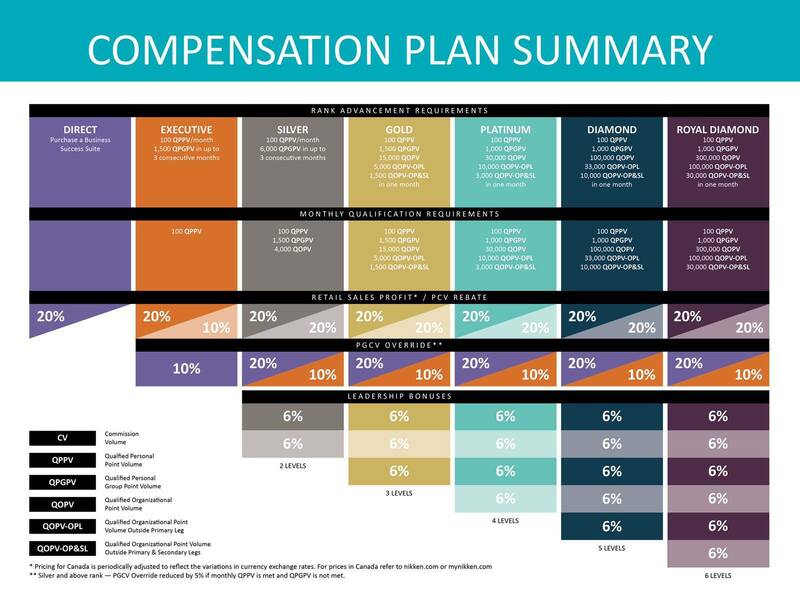 The new compensation plan as illustrated below has been designed to reward lower ranks earlier. We shall see when the 2017 figures are released.